Good & Green exists to inspire Eco-ethical living. Designing brilliant Eco-ethical products we aspire to ensure long desired intersection between quality living and social good. We believe it’s our responsibility to leave the world a better place to live than we found it. 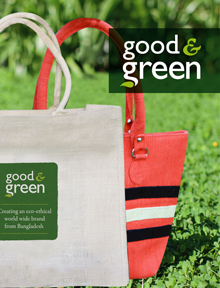 ‘Good & Green’ is a socially motivated brand based in Dhaka, Bangladesh, creating Eco-ethical products by working with artisans & manufacturers in an ethical setup across the country. Our product ranges from Eco-ethical packaging solution (jute & handmade & recycled paper items), Eco-ethical fashion (Ladies Hand bag), gift items, & home decor etc. All ‘Good&Green’ activities are driven by its four philosophical bottom lines: People, Planet, product, and Positive impact. Eco-ethical Packaging: WE offer Eco-ethical packaging made out of Jute-a natural fiber, and handmade and recycled paper. It includes conventional packaging, gift packaging, shopping bag, carry bag, etc. Eco-ethical Fashion: We offer Eco-ethical Ladies hand bag, Clutch bag, and Wallet made out of Jute and JOCO (Jute + Cotton), and Jute and Leather mixed design of Ladies bag, laptop and iPad bag etc. Gift & Office Materials: We offer gift item i.e. Greetings card, paper box etc, and Office Materials i.e. Diary, Note book, Envelope etc, made out of Handmade and recycled paper. Home decor: We offer home decor items made out of Jute and cotton with elegant design. Please look into our product section to have an in-depth understanding about what we produce. We believe business and social good is possible. In past years we’ve come across many industries, companies that could act more Eco-ethically and make money too. Our vision is to bring Eco-ethical process and practice in these industries by giving them brilliant alternative. 1. In last few years the world has gone through few significant shifts. Human civilization has made immense progress in achieving growth and development by advancing technology. On the other hand, our long demanded sustainability fall into the brink of question and climate change has become the most critical problem human race has ever faced. We understand this challenge and we hate to sit still when our mother earth is losing its glamour by every passing day. We want to make our own contribution. 2. The market of shopping and fashion bag, paper, and handicraft is a billion dollar market globally but the working condition, payment and life standard of people working in these industries is one of the worst conditions. We want to put an end to this cycle of exploitation. We believe business and social good is possible. 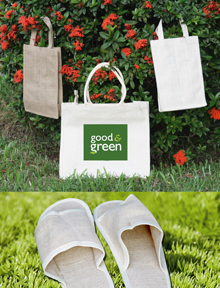 Think best design, best quality & Eco-ethical products- that’s what Good & Green stands for. We ensure state-of-the-art production and creation process for the manufacture of our products through close monitoring, training of workers, and continuous improvement. Conscious of its commitment to the environment, every stage in the production process remains environment friendly. The work force is skilled and trained to ensure that each product with the ‘Good & Green’ label meets the most exacting standards. We have close connection with Jute Diversification Promotion Center here in Dhaka, Bangladesh, that helps us with artisan training, quality advising, and diversification strategies time to time. We have our in-house designer to ensure flawless contemporary design and we also collaborate with prominent designers time to time to bring new stunning designs. More than 2500 people are directly or indirectly involved with Good & Green, who are depends on Good & Green for their livelihood, in our process of creating best products for you. Our creators have experience of working with Jute and JDPs for more than 10 years. We know the ins and outs of Jute & JDPs. Bangladesh is the largest producer of Jute and jute related products. Our farmers produce finest and world’s best quality jute. Therefore, we believe we only can produce the best jute diversified products. And we’re on a mission to put this belief into action. We’ve simple philosophy to guide our day to day activities: People, Planet, product, and Positive impact. This finds expression in everything that we do: from the sourcing of raw materials to the packing of the finished products. Each stage is carefully monitored to ensure that we remain ‘Eco-ethical’. Jute is a great alternative to the common “one trip” plastic carrier bags that pollute our landfills in their billions and take hundreds of years to degrade. By comparison, Jute bags are strong, sturdy and enable re-use many times over. We urge you to switch to Eco-ethical bags/products for a sustainable future. We believe business is the sustainable charity and want to use it to bring qualitative and sustainable change to the life of disadvantaged. We maintain a close connection with our creators of products in order to reestablish confidence in our customers in the quality of Bangladeshi products and our creators for their ability to create high-quality and fashionable products. We believe customer comes first and everything else will follow if we can delight our customers. Quality and design can be put together. Highest quality is what we always aspire for. Culture makes all the difference. We love change for better. Our experience makes who we are. We become what we wear and use. We believe that if we want anything from the deep of our heart we can make it.